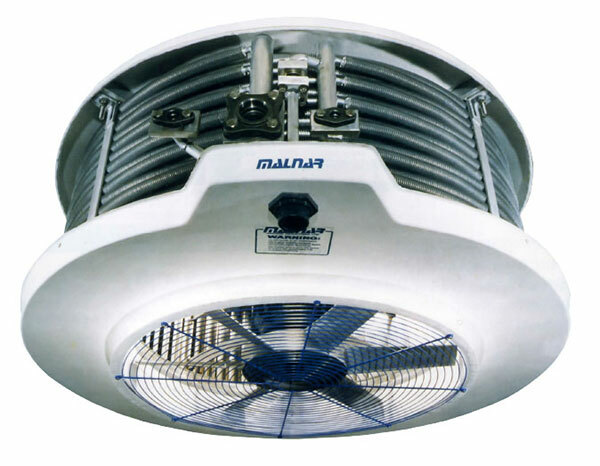 Malnar Industries Ltd. Is a proven manufacturer of aluminum circular evaporators. For over 30 years the superior quality of Malnar circular evaporators has proven its effectiveness time and time again. Each Malnar circular evaporator has been fully engineered to yield maximum heat transfer. Combining computer aided design (CAD) along with years of experience in the refrigeration industry, you can be assured that every evaporator leaving our factory has been completely designed with your requirements in mind. Due to the all aluminum construction of the evaporator, an increased heat transfer rate is achieved. Also, the aluminum construction gives the installation of our evaporators the advantage by reducing the unit weight by up to 50% compared to conventional galvanized steel evaporators. The aluminum evaporators provide excellent corrosion resistance1 with all materials being USDA approved. With six different styles of evaporators available, an optimum compatibility for capacity in a broad range of applications is available. All circular evaporators are manufactured and tested by our staff to meet our exacting standards. Completed units are shipped as a fully assembled, ready to install unit. The frame is constructed of a lightweight but durable and strong aluminum alloy. The cooling coil is constructed of 5/8” x 0.058” wall aluminum tubing for a primary surface with 5/8” x 0.020” aluminum fin acting as the secondary surface. The spirally wound fin is mechanically joined to the knurled aluminum tube to ensure that positive contact is made between the primary and secondary surfaces. Direct drive axial fans are cast aluminum design. Axial fans circulate air at high volumes with minimum horsepower requirements. Lower speeds reduce the operating noise of the entire unit. Electric Motors are totally enclosed air over and are modified to meet Malnar specifications. These specifications include changing to sealed bearings, “fling-ring” added to the shaft to prevent moisture from entering the motor, additional gaskets to be supplied between the motor body and the conduit box, and drain holes drilled into the bottom face of the motor. Motors can be supplied in 230/460 or 575V, 3 phase, 60 Hz at 850 RPM. The top cap and the drain pan are both constructed of fiberglass and finished in a brilliant white colour. The drain pan is insulated with 3/4” thick polyurethane sandwiched by the fiberglass coating. The drain pan is also sloped to enable quick and complete drainage of the condensate. © Malnar Industries 2019. Site by Print Studio One | Three-Six North Marketing.